Fire up the grill and get the nachos in the oven. September is nigh, and here in Wildcat Country that means football comes into play in a big way. Our beloved Wildcats will soon take the field, and shortly after that the New England Patriots will hit the gridiron at Foxboro. That’s where one Wildcat will be. Samantha Agyeman is studying biomedical sciences in the UNH College of Life Sciences and Agriculture. She plans to become a pediatrician. This fall, Samantha Agyeman will take the field at Gillette Stadium in Foxboro, Massachusetts, to cheer for the New England Patriots. Agyeman, a huge Pats fan, considers her place on the 2017-2018 roster a big honor, but it’s only one fact among many that make this senior biomedical science major remarkable. The Leominster, Massachusetts, native is the first person in her family to attend a four-year college. And she doesn’t just have her eyes set on a bachelor’s degree. After graduation she plans to pursue a master’s degree in pharmacology, then work for a couple of years, then apply to medical school. Her ultimate goal is to become a pediatrician. Even before she arrived at UNH in 2014, Agyeman did “everything.” In high school, she was a landscaper and worked at Abercrombie & Fitch, Walgreens and a country club. She also spent time playing games and creating arts and crafts with hospitalized children as a volunteer for Project Sunshine. Along with her jobs and volunteer work, Agyeman also attended dance classes every weekday after school, sometimes not getting home to begin her homework until 9 or 10 at night. Since the age of 16, she has competed in pageants, and she was the 2014 U.S.A. Ambassador Pageant teen titleholder. 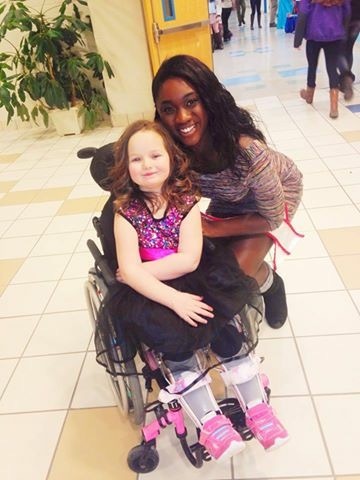 During her first year at UNH, Agyeman competed in the Miss NH USA pageant and made the top 10. She was unsatisfied by anything less than the top spot, however, and considered the experience a “failure” but also a good learning experience. So with her schedule already so full, why did she decide to try out for the Patriots’ cheerleading team? The answer reveals another key fact about Agyeman: When she sets her mind on something, she makes it happen. The New England Patriots’ first home game of the regular NFL season is Thursday, Sept. 7, against the Kansas City Chiefs. 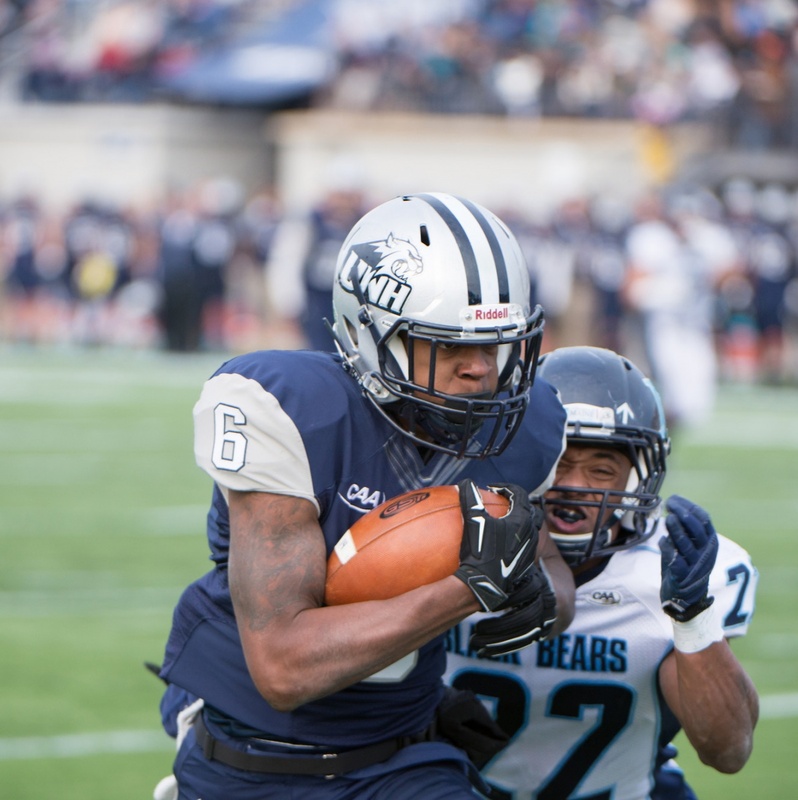 The UNH Wildcats take the field for their home opener versus Maine on Thursday, Aug. 31. She also upped her volunteer work. “We’re not just people who dance on the sidelines; we’re public figures and leaders in the community,” she says, naming just a few of the many organizations — Brides Against Breast Cancer; Best Buddies, American Cancer Society — she gave time and energy to while preparing for tryouts. Agyeman also continued to serve Project Sunshine, recruiting other volunteers on the UNH campus and organizing fundraisers to support the purchase of supplies and transportation for the group to area hospitals. On the field this fall, Agyeman won’t be the only cheerleader who’s heard the sonorous ring of Thompson Hall’s bells. She’ll be joined by classmate Courtney Phillips '18 and alumnae Alyssa Crane '15, Jamie McDonough '14 and Jennifer Azarian '13. It may be one of the only times Agyeman is happy to be on the sidelines.